A 5km wide asteroid named 3200 Phaethon will brush past Earth just before Christmas. It will brush "quite close" to Earth on December 17, Russian astronomers have shown. Experts at the Immanuel Kant Baltic Federal University in Konigsberg, Russia, have published a video that tracks Phaethon's path. The object, which Nasa has previously described as a "potentially hazardous asteroid", will pass 10.3m km from Earth - relatively close in space terms. At 5km wide, the asteroid is roughly half the size of Chicxulub, the rock that wiped out the dinosaurs. Its unusual orbit will put it closer to the sun than any other named asteroid. 3200 Phaethon has puzzled scientists because it has features of both an asteroid and a comet. In one of its previous close encounters with Earth, scientists spotted dust streaming from the space rock that resembles the melting ice tails tailing most comets. But Phaethon's orbit puts its origins in a region between Mars and Jupiter where asteroids commonly originate. Typically, icy comets come from colder regions beyond Neptune. Immanuel Kant Baltic Federal University said: "Apparently, this asteroid was once a much bigger object. "But its many approaches to the sun have caused it to crumble into smaller pieces, which eventually formed this meteor shower. 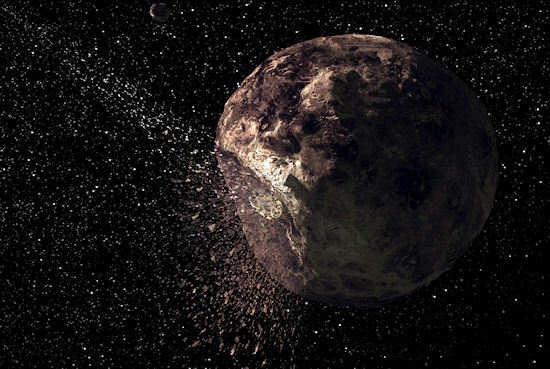 "If so, the asteroid itself could be the residue of a comet nucleus. "The asteroid's extremely elongated orbit, thanks to which it sometimes gets to the sun closer than Mercury and it sometimes moves away farther than Mars, is another argument in favor of this theory." The asteroid is named after the son of the Greek sun god Helios because it passes so close to the sun. Legend claims the young demi-god was challenged to prove he was related to Helios, who was said to pull the sun across the sky. To prove his divine provenance, Phaethon rode his father's chariot but was unable to control the horses, which then ran wild across the sky, dragging the sun with them. Earth was almost destroyed in the ensuing chaos, which scorched the planet, burned vast amounts of vegetation and created the great deserts of Africa.